I always considered cod a fish from the world of “industrial” cooking because it is easy to find precooked and frozen in various shapes and flavors. For this reason, I was always careful to avoid buying it. One winter we went to Boston to spend Christmas with our son. It was in Boston where I experienced the goodness of fresh cod and combinations that you can do to make it pleasant tasting. I discovered that cod fisheries are in the cold waters of the north managed by many Italians (Sicilians) who emigrated specifically to work in these fisheries. Returning home, I tried this recipe that combines a fish from cold seas with lovely herbs from the heat and sun. The recipe is fast and low in fat. Wash the fillets and dry them thoroughly. Grease a baking dish with very little oil. Blend the herbs with the bread crumbs. 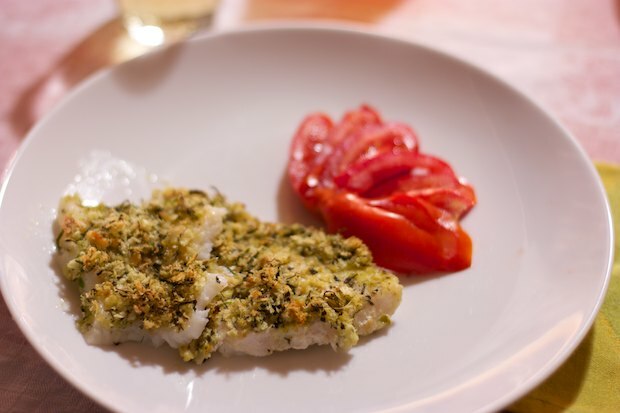 Brush each fillet with a bit of olive oil and turn them in the mixture of herbs and bread crumbs. Arrange in a pan and add a little of any remaining bread crumbs over each fillet. Add salt to taste and add a little pepper. Bake in preheated oven for 30 minutes. Serve in individual dishes with a few tomatoes. Posted in Fish and tagged with Cod Fillets with Aromatics, Filetti di Merluzzo agli Aromi. RSS 2.0 feed.